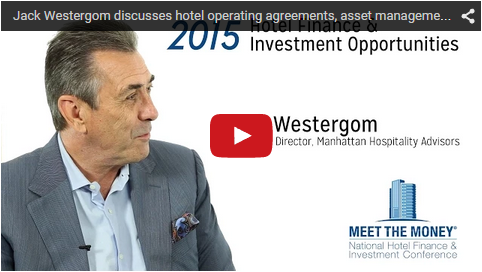 Jack Westergom, Managing Director of Manhattan Hospitality Advisors, discusses hotel operating agreements, asset management, and the RFP process in the video below. 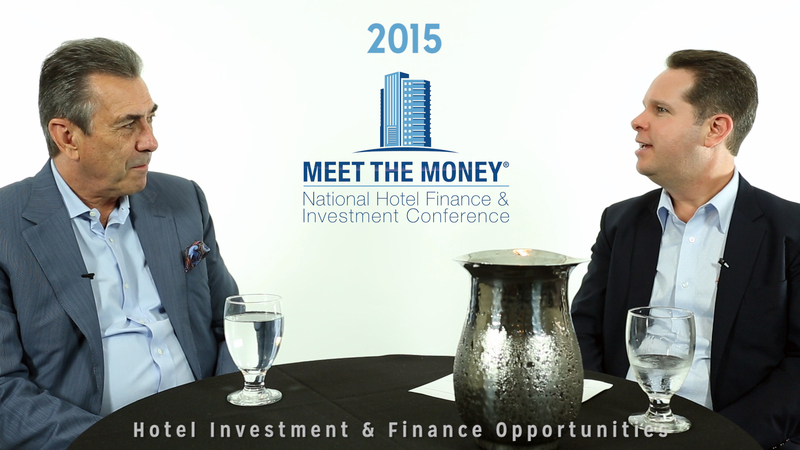 Jack spoke with David Sudeck, a senior partner in the JMBM Global Hospitality Group®, as part of our video interview series on hotel finance and investment opportunities in 2015. David Sudeck: I’m David Sudeck. I’m a senior attorney with Global Hospitality Group® at Jeffer Mangels Butler & Mitchell. We’re here at the 25th Annual Meet the Money® Conference. I’m here with Jack Westergom, Managing Director of Manhattan Hospitality Advisors. Welcome. David Sudeck: Tell me, how many times have you been to the Meet the Money® Conference? David Sudeck: It’s a perfect attendance record – aspirational. Jack Westergom: I wouldn’t miss it for anything. It’s one of the best conferences in the industry today. David Sudeck: Thank you. We appreciate your participation. You’re always incredibly valuable and informative. Tell me about Manhattan Hospitality Advisors. Where you’ve come from. Where you think you’re going in today’s marketplace? Jack Westergom: Sure. The company started 20 years ago. Prior to that I had worked for a lot of the major brands as a Chief Development Officer, VP Marketing, Senior VP of Marketing for a couple of international companies, owned my own management company. A couple downturns ago, many downturns ago–1988 to 1993–I had gotten to the point in my life where I had built hotels, operated hotels and worked on a lot of different hotels for other folks. Decided I wanted to spread my wings, start out on my own and apply the knowledge I had gained in the first 15 years I’d been in the business to my own company, and I’ve been doing this for 20 years and have done a lot of exciting things with you and your firm – JMBM. David Sudeck: We appreciate that. Jack Westergom: We’ve asset managed about $8 billion of hotels, mostly luxury, upscale, high-end boutique. Everything from a number of Four Seasons hotels, Ritz Carltons, Rosewoods and so forth, and then we’ve also done a lot of hotels, this hotel in particular, this 802-room Sheraton is one of ours that we asset managed for our Chinese client. David Sudeck: And you undertook the feasibility in connection with the acquisition as well? Jack Westergom: We did. A lot of our work comes from doing due diligence on assets, much of which we also have to do with JMBM, which we like working with. We think we make a great team–you on the legal side and our work on the more pragmatic operational side of it. We also help build hotels as the owner’s rep, which we kind of look at as asset management but instead of asset managing existing hotels, we’re managing the asset during the construction process to make sure that when it does open, it’ll be profitable. David Sudeck: So are you actually putting together the pro formas or is that the role of the management company? Jack Westergom: …for a hotel. Jack Westergom: Incredible value and, I think, I’m not sure if it was you or Jim said it, that a great hotel management agreement can probably add about 25% of the value to an asset, and I’m a firm believer in that. It certainly gives you the ground rules for how you’re going to operate with both the operator and the owner. And we do everything, as owner’s rep, from write the program that the architect takes to construct the hotel. We help put together the team, engage the operator, engage the architect, interior designer, all the way down to the hardware consultant, and then manage the development process through it. David Sudeck: And you’ve been working internationally, correct? Jack Westergom: Correct. We’ve worked on hotel assets in 20 different countries and about 26 different states throughout the United States. We currently have development projects that we’re working on—a new One and Only in Sicily. A new One and Only in Mexico and we also have a bunch of domestic projects that we’re working on as project manager/owner’s rep. The Hyatt just up the street is one of our projects. We got a $60,000,000 renovation taking a 53-year-old hotel and breathing life back into it again. David Sudeck: That sounds like fun. Jack Westergom: And creating a more, a newer, more upscale property that will be more in tune with today’s traveler. David Sudeck: Interesting. So, full range of services. You have a team I’ve enjoyed working with. David Sudeck: So tell me what are your expansion goals? What do you see 2016 and beyond? Jack Westergom: Well, we sort of change and adapt depending on the real estate cycle. When you’ve been in the business as long as I have, over 30 years, you’ve seen many real estate cycles come and go. So we can sort of time things, but it’s a good time to be in the business right now. It’s a lot of new build, a lot of renovation work. During the downturn and downturn periods, we work more on distress assets, on helping to create value, and that’s sort of what we adjust to but I’m thinking that the real estate cycle probably has another 2-1/2 years of good life in it right now before the economy takes hold and things get a little bit gloomier. David Sudeck: Interesting. Give me a sense as to the different types of clients you’re representing as well. I know that for some of my clients, they’ve been new to the industry. You’ve really held their hand through acquisition, feasibility, asset management, all services. You also represent some fairly large, more institutional owners. Jack Westergom: Sure, it’s interesting. I think about 55% of our clients are first-time hotel owners or developers, folks that are highly successful and other real estate types, that for one reason or another have decided to expand into the hospitality arena and have done so, and then engage our company’s services to help guide them through the process and avoid the pitfalls and minefields that you would encounter along the way. And then we have more institutional clients like Michael Dell’s MSD Capital, and companies like Amalgamated Bank that do institutional work, and we help them in the process. One of my favorite phrases is that many of our clients could afford the hire anybody but they hire us, because I’d like to think that we’re smaller, more nimble than many of our other direct competitors, and because of that, they also like to deal with the principals. I see a lot of that in you, personally, where you take a personal interest in your clients and they greatly appreciate that and don’t get relegated to second and third level attorneys as they do in other hospitality law firms. David Sudeck: I think we both hope to be an extension of the good team. David Sudeck: And so, and by the way, the feedback I’ve gotten is consistently good. So we appreciate the support you’ve given us in all aspects. David Sudeck: One more question about RFPs. I know you frequently work with us to run an RFP. Can you give our audience a sense as to what is the RFP process in connection with the hotel management agreement, and what’s the value in that? Jack Westergom: Sure. We do an RFP process, which is Request For Proposal. We do that, actually, for lots of disciplines in our practice. We do everything from when we’re assembling a team to help build hotels or renovate hotels, when we’re doing an RFP for an operator. We like doing that as opposed to just going out to one or two operators. It creates a sense of contest. A sense of competition between the operators usually generates better terms for the end-user, which is ultimately the developer. We’re currently working on one in Costa Rica that we have just taken up to an exciting point. David Sudeck: Ah, very nice. Jack Westergom: …to take that process through and work with us to come up with a successful operating agreement that they can then use and help build a hotel. David Sudeck: We’ve had a very collaborative relationship with respect to hotel management agreements and getting your market insight has been great. Jack Westergom: Absolutely. I like actually working with you, in particular. There’s lots of attorneys in our industry that spend an awful lot of time trying to negotiate terms that are exceptionally difficult to get. Often, don’t get–and in fact take up a lot of time and cause the client to spend a lot of money without an end result. What I like about working with you and your team, in particular, is that you know exactly what to go after, to come up with the best terms for that particular project, at that particular time. David Sudeck: Thank you very much. Jack Westergom: Not a lot of waste effort, and more importantly, you end up with a management agreement that is a win-win for the client, the owner, as well as for the brand. I think you and I share the same belief that the best agreement is one that both parties can walk away from saying that this is a pretty good deal for both of us. Jack Westergom: And that’s why I like working with you. David Sudeck: I appreciate that Jack. Anything else you want to share with our audience? Jack Westergom: I don’t think so, other than I’m happy to be here today. Jack Westergom: Hope to be here for the next 25 years? Jack Westergom: Hope you and I get a chance to work together on lots of projects. David Sudeck: Of course. Thanks Jack. Take care.